Modern aesthetic medicine relies on natural approaches. Mimicking and perfecting the body’s own regeneration processes helps in smoothing out wrinkles, restoring volume and recontouring slackened structures. We employ state-of-the art substances and techniques with a proven safety and success record. A permanent solution for excessive perspiration. Ground-breaking noninvasive technology utilizing microwave energy for the safe and permanent elimination of underarm perspiration. The miraDry system is the result of a 5-year research & development effort including an extensive long-term clinical trial directed by leading dermatologists in the United States. The miraDry system guides precisely controlled microwave energy into the area of the sweat glands. The heat induced by the energy results in thermolysis of the sweat glands. At the same time a continuous hydroceramic cooling system protects the top layer of the skin and limits the amount of heat applied to the sweat glands. Since sweat glands once treated do not regenerate, the result is effective and permanent. Most patients report a marked reduction in perspiration. A current trial saw a mean reduction in perspiration by 82%. miraDry® – A permanent solution for excessive underarm perspiration. Click here for more details. In surgical procedures blood plasma enriched in platelets is used to accelerate wound healing and reduce wound pain. While the effect of biostimulation on skin appearance is a notable increase in radiance and freshness, this technique can also reduce wrinkles. The effect slowly builds up over the three treatment sessions and persists for up to two years. We extract the platelet concentrate in an absolutely safe way from a small amount of your own blood and then inject it painlessly into the skin with extremely thin needles. Medical peelings offer the chance of truly biological permanent skin rejuvenation. Medical peeling removes the topmost skin layers, thus stimulating skin rejuvenation and improving pigment shift. The duration of visible side effects (reddening, scaly skin) depends on the type of peeling. We employ chemical peeling with fruit acids, salicylic acid, TCA as well as rely on one hundred percent organic Green Peel herb peeling. One outstanding special technique for treating wrinkles around the eyes and lips is Enerpeel ®. Natural fillers smooth over wrinkles and model facial features. One of the best natural fillers produced by biotechnology is hyaluronic acid. Therapeutic medicine uses this structural building block of the human body to speed up cell rejuvenation. In the treatment of wrinkles hyaluronic acid can produce a quite natural looking outcome with an almost negligible risk of allergies. Today, this effect persists for up to one year. Radiesse® is based on a calcium compound, the natural building block of bones and teeth. This volume filler is particularly well suited for modeling facial features, hands and ear lobes. 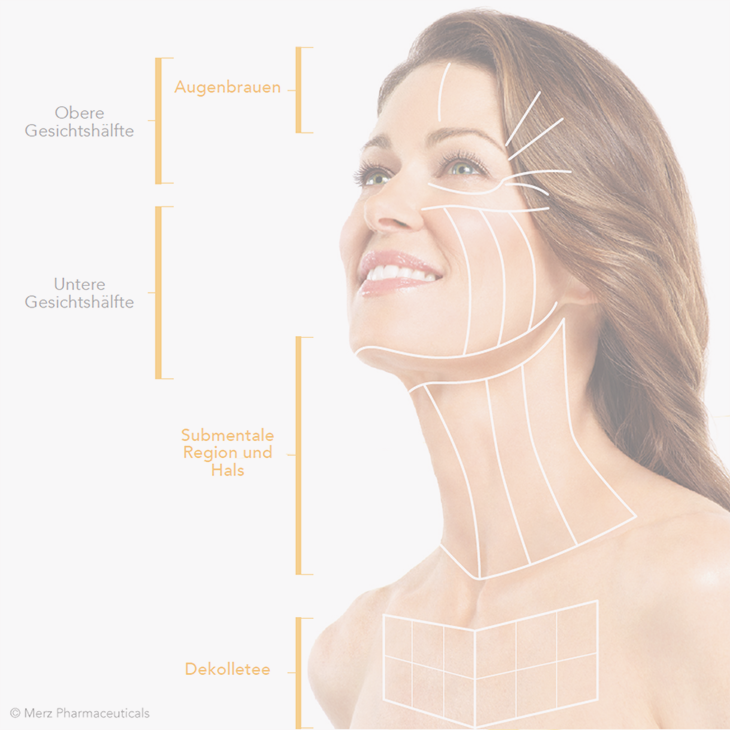 Ultherapy® is THE ultrasound skin lifting and tightening treatment by Merz Aesthetics. For sustained beauty tightening around the face, neck and cleavage – without any surgery and damage of the skin surface. The perfect solution for those unable to afford any downtime, not yet ready for surgical face-lifting and those wanting to bridge the time between aesthetic surgery procedures. Ultherapy® offers lifting effects after just one treatment session with microfocused ultrasound – the only ultrasound procedure approved by the FDA*! When the skin ages it starts losing collagen and elastin – the skin becomes increasingly slack and loses strength. Typical symptoms include drooping eyebrows, wrinkles in the face and cleavage, loss of contour around the chin and neck. Ultherapy® can help stem the march of time and primarily acts from the inside out lifting and tightening the skin. Microfocused ultrasound energy passes through the skin without damaging it and affects the tissue to a depth of up to 4.5mm. This is the skin layer typically tightened in surgical face-lifts. The skin reacts to this stimulus by building up fresh collagen and elastin. The final result becomes evident over a period of two to three months and electrifies with its younger contoured appearance. The result can improve even further up to six months after the procedure. Depending on skin condition and individual factors, some patients desire additional aesthetic measures. Your attending physician will advise you in detail, should you so desire. Wrinkles caused by individual facial movement such as smiling and frowning can be relieved by botulinum toxin (“Botox ®”). During this safe and at the same time almost painless treatment small amounts of botulinum toxin are injected. Potentially visible traces are rare, disappear quickly and can be covered with makeup right away. With its relaxing effect botulinum toxin is also exceptionally effective in wrinkle prevention. Skin resurfacing with the CO2 laser initiates complete regeneration of the skin. This technique requires a healing phase of about one week. The result is a rejuvenation effect by up to ten years. Enhancement of the skin texture is long lasting and absolutely natural. A trial has demonstrated that the assumed age in people with pigment disorders is markedly older than their actual age. When removing liver spots we rely on the ruby laser or Q-switched Nd:YAG laser. The beauticians in our Dermatocosmetics Institute will show you how to cover the lasered areas cosmetically after a few days. For this we recommend the mineral cosmetics by Jane Iredale from the United States, one of the best products in the world with premium ingredients for the perfect makeup even in heavily damaged skin. We treat large brownish discolorations in the face, melasmas and chloasmas with a combined regimen of laser therapy and melanin inhibitors. Very good results are also obtained with a regimen combing peeling, mask and creme having a biological effect on pigment production. Frequently fat pads such as “love handles” and “saddlebags” have a genetic side to them. One alternative to mechanical liposuction is injection lipolysis, also known as “mesotherapy”, which has come into use since the mid-nineties. A natural agent made of soy beans is injected directly into the affected areas. This treatment can dissolve the fat biochemically and stimulate natural fat degradation; however, this method is not suitable for losing weight. We eliminate unwanted hair growth with the diode laser and Nd:YAG laser. After about six to twelve treatment sessions over a period of around four weeks this leaves the skin smooth and soft. In order to maintain the success of this treatment, some of the patients must undergo between one and three further treatment sessions annually in subsequent years. As a matter of principle, we always discuss openly and in detail the effect and possible risks before treatment is started.